Methylcobalamin is the form of vitamin B12 active in the central nervous system. It is an active coenzyme of the vitamin B12 analogs, that is essential for cell growth and replication. The liver may not convert cyanocobalamin, the common supplemental form of vitamin B12, into adequate amounts of methylcobalamin the body may need for proper neuronal functioning. 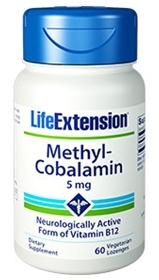 Methylcobalamin may exert its neuroprotective effects through enhanced methylation, acceleration of nerve cell growth, or its ability to promote healthy homocysteine levels. For methylcobalamin to be available to the brain, it should be allowed to dissolve under the tongue. Other ingredients: sorbitol, mannitol, caramel flavor, vanilla flavor, croscarmellose sodium, magnesium stearate. Contains corn. This product contains NO milk, egg, fish, peanuts, crustacean shellfish (lobster, crab, shrimp), soybeans, tree nuts, wheat, yeast, gluten, or rice. Contains NO artificial sweeteners. Take one lozenge, one to eight times daily. Allow to dissolve in the mouth before swallowing.